One iconic costume that is instantly recognizable and very elegant is the Phantom of the Opera costume – ( Le Fantôme de l’Opéra). This is a great costume choice for anyone that wants their identity to remain secret since half the face is covered with a mask. It’s also a good choice for anyone looking for a “gothic” costume but doesn’t want to get too goth! It’s probably not the best costume choice for a hot halloween night since you’re fully clothed with a cape and everything. Let’s take a look at how to do it yourself and what pieces are required to make your own homemade Phantom of the Opera costume! 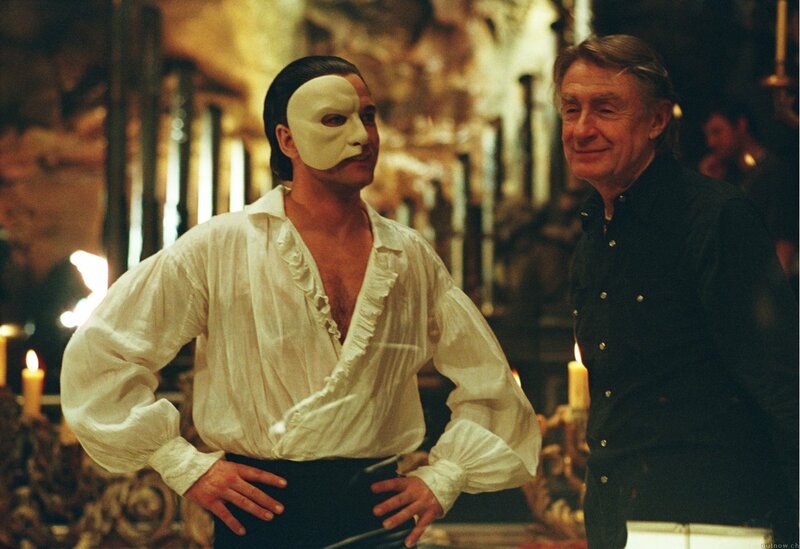 The most important piece of the Phantom of the Opera costume is the mask. Without the mask you are going to have a hard time with people recognizing what you are. 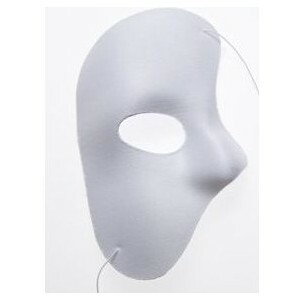 The Phantom’s mask is different from a “superhero” mask or any other type of mask in that it only covers one eye! 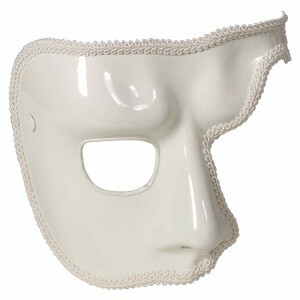 The traditional color of the mask is white, although you can choose a black mask if you have no other choice. 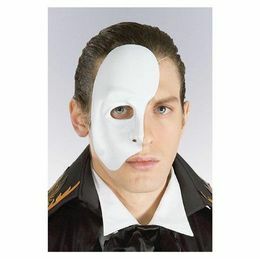 If you want to save some money, you don’t acutally have to purchase a Phantom mask, but rather you can get some white face paint and paint it on. 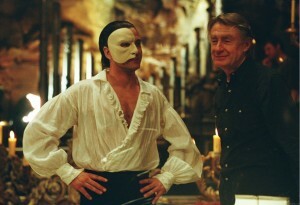 Here are some Phantom of the Opera masks so you get the idea of what it looks like…. 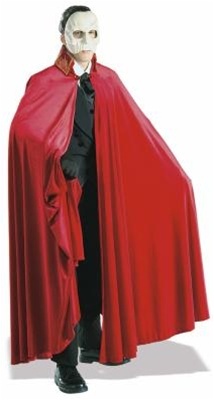 The Phantom always wears a cape, and in fact there is something called an Opera Cape – or sometimes called an Opera Cloak. 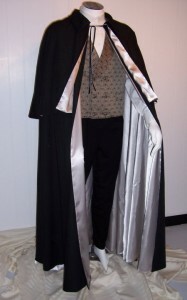 This kind of cape is typically made of something like velvet and was popular as part of formal evening wear because it was worn over clothing to keep the individual warm. 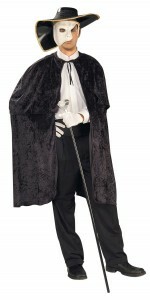 The benefit of wearing a cloak or cape over a jacket is that it did not crush the person’s formal evening clothing. This is the kind of cape you want to choose for your costume. The traditional color for the cape is black with a contrasting interior ivory color, however red on the exterior will work as well. 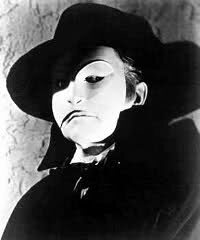 The type of hat that the Phantom of the Opera wore was a wide-brimmed fedora. 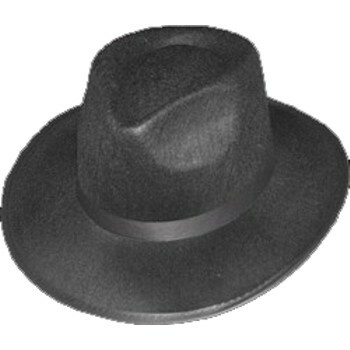 A traditional fedora will work as well. Here are some pictures.. 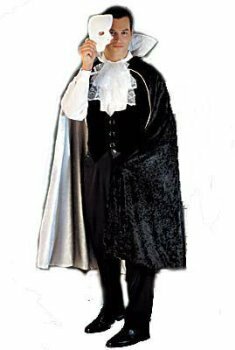 Under the cape, the Phantom wears formal Opera evening wear – a white shirt, black pants, and black shoes will work nicely. Accessorize with a cane to complete the look! Who was the Phantom of the Opera? Le Fantôme de l’Opéra was a character from a Gothic novel from French writer Gaston Leroux. It is about a man who is a “musical genius” and lives his life hidden in the Paris Opera House but falls in love.